Sorry I haven’t blogged in a while. I’ve been a busy little bee this summer. I’ll shortly be getting a break, as I’m going to Williamsburg for about a week in about a week with my cruise friend Heidi. Here is hoping we get a break from this insane heat! Alas as of right now, it’s supposed to be in the upper 90s, with two days at 99. I think I’m gunna have to go hit up Old Navy to buy some very cheap, very light weight t-shirts! My garden has been giving me a headache this week. It took forever, but I finally started getting red tomatoes off my Topsy Turvy Tree. I have a million green ones though. Unfortunately two of the ones I put in large planters, have gotten too large. One toppled over night, and the other toppled today in the heat. Yes I had staked and roped them, they still grew too big! I had to cut a lot off, and lost a lot of green tomatoes, but hopefully saved more. We’ll see. Next year I think I’m just sticking with just the Topsy Turvys, lots of them. They don’t seem to grow as big as my planter ones did, but they are the ones not giving me a headache right now. The film was a fitting end, and for the most part did the book justice. All the “kissing” moments I found awkward, and had to hold my need to giggle in when they happened. Also why they feel the need to make Harry and Ron take their clothes off I don’t know. I get they are English, but holy hell, they need tans! I saw it in 3D. Is it necessary? Not really. There are only a few parts of the film that really used the 3D well, everything else was just mainly depth. It was a film converted to 3D, not entirely filmed in it. There were a few scenes you know they threw in for the 3D though, and those were the only ones that made the 3D worth it. If you can see it on the Imax (which I didn’t), I’d say do it! I plan to see it again I know, and I will see it on the Imax next time. However it’s probably hard to find it on Imax not in 3D, the two go hand in hand nowadays. The action sequences, which this film is full of, are intense. It makes sitting through the first part, which honestly was a bit of a bore, all worth it. Okay from here on out are SPOILERS! I just can’t talk about my thoughts on this film, without SPOILING things! If you’ve read the books, really I’m not spoiling much at all. The best scene of the book, Mrs. Weasely’s fight with Beatrix, I wanted to last longer. It was still great, and basically the scene everyone wanted to see above all others, including the end of Voldermort. Aside from the end of the film, I think it got the most applause. I felt a lot of the Hogwarts battles and the loss of some of the kids were only quickly addressed. For example, I remember the killing of the Werewolf character as being much more grand in the book? I also remember a lot more of the kids gruesome ends. I guess they couldn’t just have a movie with too many kids getting off’d though. The biggest omission was the back story about Dumbledore and Grinwald. Actually it was completely omitted! In the movie when Harry and his friends arrive at Hogsmead, the only mention of the past is by Dumbledore’s brother who mentions Albus’ quest for power which drove them apart and led to their sister’s death. In the book we learn that Albus and his BFF (gay lover?) 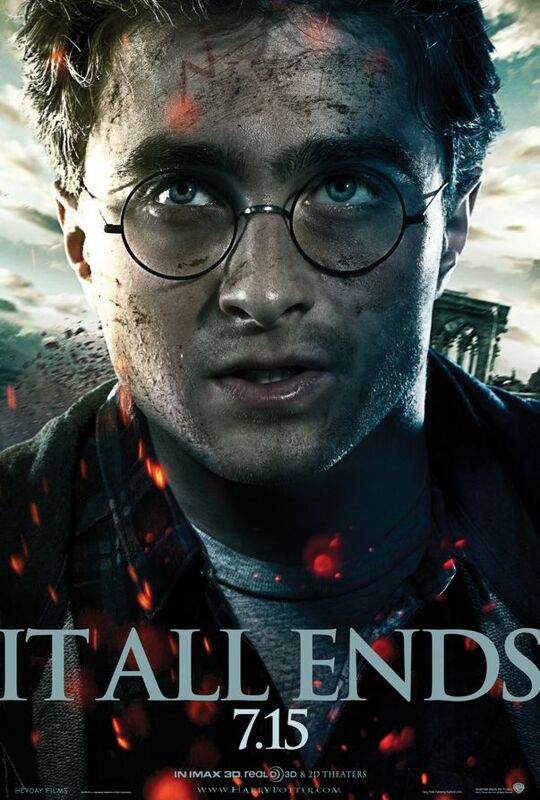 Grinwald (who we see in a flashback stealing the Elderwand in Part 1) were on a quest to find all the Deathly Hallows. Given it’s the name of the movie, you’d think this story would have been important enough to put it! It was Dumbledore’s quest for power that not only put him at odds with his family, but brought about his end. Another glossed over scene was the explanation of “the ring.” The second Horocrux (sp?) was Tom Riddle’s (Voldermort’s) ring, which in fact was a symbol of the Deathly Hallows. Still obsessed with them years later, Dumbledore put it on, only to find out it was cursed and would bring about his death. Snape slowed it down, but Dumbledore was doomed to die, which is why he asked Snaped to kill him . . . to keep Malfoy from doing so as he was ordered to. Another thing I felt might be fuzzy if you didn’t read the books, was the back story with Snape and Lilly as well as his patronus. The back story was major parts of books 5 and 6, completely omitted from those movies. So they had to basically condense all of it very quickly into this movie that Snape always loved Harry’s mother Lilly, and because of that love his patronus was a doe because her’s was. It was Snape who brought the sword to Harry in the previous movie, when he thought it was his mother. In the past Snape came to Dumbledore, defecting from Voldermort, when he learned Voldermort planned to kill the Potters. In exchange for his help (and betrayal of Voldermort) that is why Dumbledore gave him a job at Hogwarts. That is why in the earlier films Voldermort’s followers didn’t trust him. However for the entire series, Snape had actually been looking over Harry . . . remember back to Book/Movie 1 . . . during the Quidich Tournament when it appeared Snape was cursing Harry? He was countering Professor Quirrel’s curse at the time. This scene is quickly shown, along with others . . . but in the book you really realize how many times Snape was there guarding and teaching Harry all along, preparing him. But still, it was a great movie, and for ONCE they actually got the end of the book right! The last few movies the end of the books were all changed for the movies, usually not in the best ways either. Figured I’d just make a quick check-in post. I’m currently in Virginia getting some unfortunate cavities taken care of. My tomato garden has become a jungle at home. But even though I have 30+ tomatoes, they are all still green! I might have to open up a lesbian railroad cafe soon! I’ve seen a few movies over the past month I haven’t reviewed, so here are my quick thoughts on them . . .
Green Lantern – Not as horrible as everyone made it out to be! A bit long, needed some editing, and too much of an origins story. The only real action sequence is at the very end of the movie. Horrible Bosses – Horrible dirty comedy, nothing terribly special or remarkable. Jennifer Aniston steals the whole movie, and she’s not in it all that much. Transformers 3 – A-maze-ing! Of course I saw it in Imax and 3D. Definitely the best of all the movies, and more than makes up for that crap fest that was number 2. Posted in Just Life, Movies | Comments Off on Just Checking In! Mini-Movie Thoughts . . .
Monster Mania this August has probably one of the best line-ups ever, including stars from some of my favorite childhood movies and TV shows . . .
Posted in Movies | Comments Off on OMG I May Just Die!